Ananka's Diary: Wanted: First-Hand Report of Horrible Spider Invasion! Wanted: First-Hand Report of Horrible Spider Invasion! Giant spiders are terrorizing the Australian town of Bowen. After heavy rains washed them out of their well-hidden homes, the normally reclusive eastern tarantulas (aka: "bird-eating spiders") started making quite a few public appearances. The citizens of Bowen are justifiably concerned! No one wants to find a hairy, hissing (yes, they do that) six-inch-long spider in the garden. To make matters even worse, experts say the beasts ARE venomous. 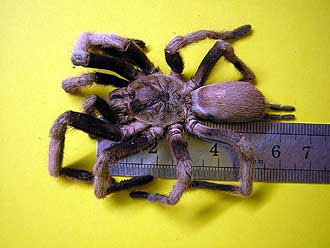 One bite from an eastern tarantula can kill a pet or make a human beg for mommy/mummy. So I'm reaching out to all of our Australian readers. Do any of you have friends or family in Bowen? Any chance we could get a first-hand account of life in a town overrun by giant spiders? Kirsten- I have been doing research on secret societies (inbetween homework) and I found this website: http://www.masonicinfo.com The freemasons at the root of a lot of secret societies (such as the illuminati) and tend to keep very secret. My uncle is a freemason (its only men) so I am trying to dig up as much as I can. More info coming! http://illuminati.org/ http://www.boogles.com/local/Illuminati/ http://www.illuminati-news.com/moriah.htm http://www.prolognet.qc.ca/clyde/illumin.htm Much of this seems to be a bit insane, based on paranoia and panic, but it's still incredibly intresting. I have a new project! :) I am planning on talking to some of my teachers, and do some background research in my area, then go worldwide. I will keep you posted! OH liltomboyblue: my mom said that my great grandfather was a freemason but no one found it out till he was dead. i dont knw anything about it. nieghther does she i supposed. but i know of some other societys that are in a way secret. ill have to ask mi mom about it. (she studys englan and france-mostly queens kings. sh e actualy found we are related to some ppl of the royal family. idk who. but we are not trying to rub it in ppls face i swear! she has some proof and she is obscessed!) idk. yea, but she told me about some sociey that is frm that area! EEEEEWWWWWWWWWW!!!!!!! Lucky I'm not in Bowen! Oh yucky! When I was around 10 years old, we went to a picnic with lots of family and friends, and there was this HUGE, HUGE, HUGE spider in the girls toilets, (I think it was a huntsman), it was so huge, on the ceiling, that even some boys actually went in to see it. It was 3D, around the size of a dinner plate, which is the size of a huntsman. But I couldn't believe my eyes! Normally those things you only see on TV! Since these have been crawling out of their homes, DOES THIS MEAN THEY SECRETLY LIVE IN OUR HOMES TOO?!!! NOOOOOOOO! If I see one, I will faint! Seriously! Just looking at that photo brings up the v.o.m.i.t. No wonder there's so many spiders crawling around! It's Queensland, the most tropical state of Australia! And a certain phenomena called Global Warming has caused quite a stir in seasonal weather patterns. Winter started way early for us than usual. I am very glad I live no no where near Bowen. liltomboyblue: you should read "Conspiracy Theories for Dummies." I'm NOT saying you're a Dummie/dummy or anything, but this books was really interesting, with a whole chapter devoted to secert societies. And ever since I read and learnt about the Freemasons, I always spot a Masonary house where I never expected to. Liltomboyblue: the illuminati are at the root of the freemasons, but the Knights Templar are at the root of the freemasons! A good book on secret societies is Secret Societies: Inside the World's Most Notorious Organizations by John Reynolds. I read it a couple years ago for a book report for school. It's probably one of the most interesting books I've ever read (after Kiki Strike, of course :D). One of the most interesting things about them, is that they were supposedly founded on May 1st 1776, but the illuminati have been traced back until the roman empire. Also, the illuminati aren't at the root of the freemasons, but rooted in. Like a secret society inside a secret society. Anonymous 1: I'd be very interested to hear more! Brave Chickens: I didn't think thats what you meant ;) I am going to go to a couple libraries this summer and see what I can find. What I find the creepiest about tarantulas is this: they are covered in tiny, sharp, stiff hairs, which break off easily--for example, in your skin, even if you just lightly brush against one. Which I don't know why anyone in her/his right mind would want to do. Plus, I think they have venom in the hairs? Or maybe just in their mandibles. Anyway, if you get tarantuna hairs in your hand, it hurts and itches like crazy. I love spiders, but I would NOT like to find that at my house! It's wonderful that you used the correct term of "venomous" in describing these spiders. I would have been quite crushed if Kirsten/Kiki had made the mistake that most people do by saying "poisonous"! i found one in my shoes! Whatever You Do, Don't Flush That Spider! What's Hiding in YOUR Bathroom?